In October 1999, a new cypress species was discovered in northern Vietnam. It was named Xanthocyparis vietamensis. [The name Cupressus vietnamensis also appears in some garden references.] Surprisingly enough, its closest relative was found to be the Alaska cedar (Chamaecyparis nootkatensis syn. Cupressus nootkatensis), separated by thousands of miles and on opposite sides of the Pacific Ocean. The two species were so similar that the authors (Farjon et al 2002), working in Kew, England, combined them generically, and the Alaska cedar became Xanthocyparis nootkatensis. 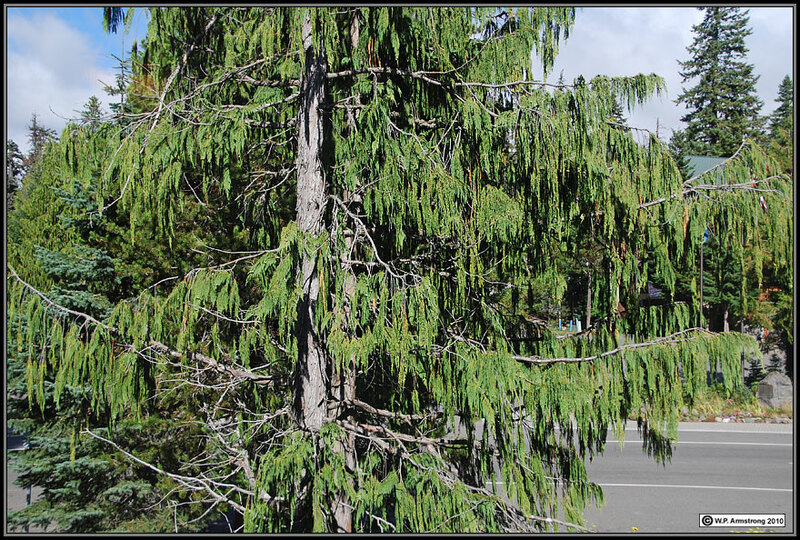 Port Orford cedar (Chamaecyparis lawsoniana) resembles other North American and Asian species of Chamaecyparis in both morphology and DNA, so its scientific name remains unchanged. It turns out that Callitropsis nootkatensis was used for the Alaska cedar in 1864, long predating the name Xanthocyparis. In accordance with the Botanical Rule of Priority, the older name must be used. Therefore, Alaska cedar becomes Callitropsis nootkatensis and the Vietnam cypress becomes Callitropsis vietnamensis. In the revised Jepson Manual: Vascular Plants of California, Jim Bartel has changed the genus Cupressus to Hesperocyparis (western cypress). Because of it similarity to Cupressus, Callitropsis may also be moved into Hesperocyparis at the 2012 Botanical Congress in Melbourne. The word "yellow" is appropriate in the common name because of the distinctive yellow color of the wood. Yellow cedar is a culturally important tree to native Americans in Alaska and British Columbia. The wood has many uses including canoe paddles, totem poles, chests, dishes, and tool handles. The bark is collected in large sheets, then cut and woven into mats and hats. It is also prepared with mountain goat wool and woven into blankets and clothing. "Culturally modified trees" where the bark has been removed can be found throughout southeastern Alaska. Totem poles are also carved from the western red cedar (Thuja plicata) that grows throughout the Pacific northwest. Generally red cedar was preferred for larger projects (houses and canoes) while Alaska cedar was used for smaller carvings such as vessels and utensils. The totem pole in following image was labeled "red cedar," however, the wood certainly has a yellow coloration. Alaska cedar (Callitropsis nootkatensis) at Government Camp, Oregon. Drooping, yellow green foliage of Alaska cedar (Callitopsis nootkatensis). 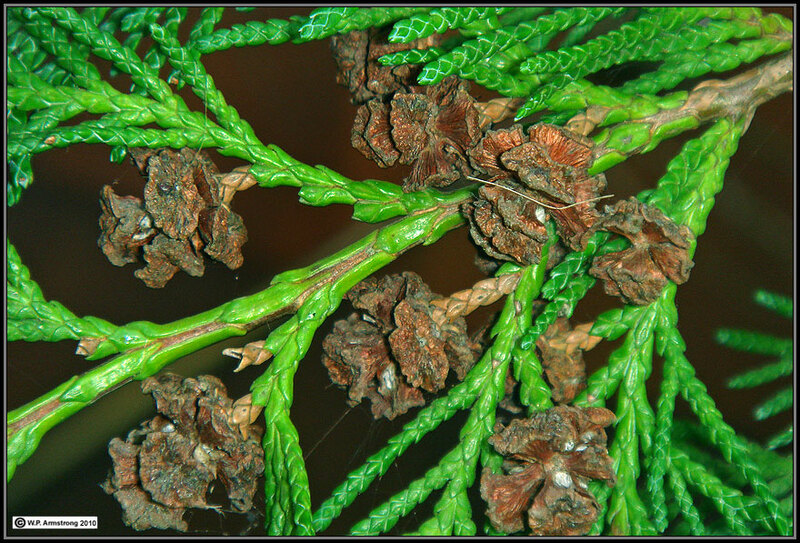 Flattened branchlets and cypress-like seed cones of Alaska cedar (Callitropsis nootkatensis). 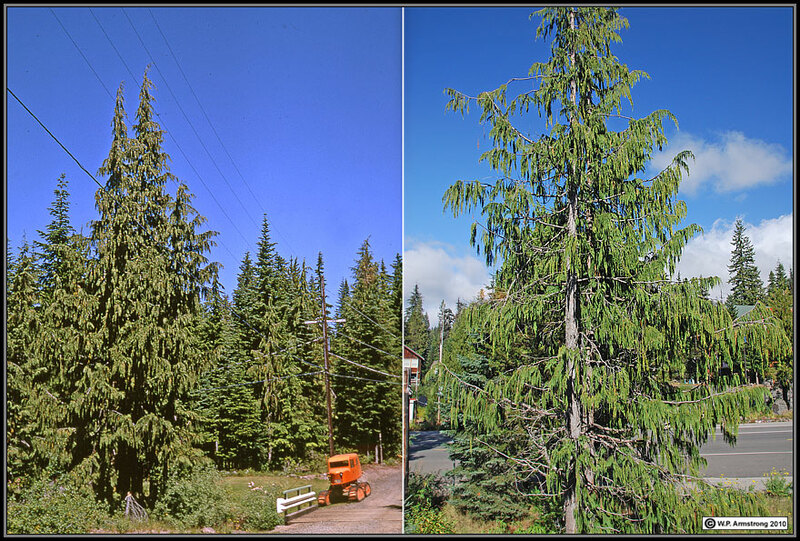 The Alaska cedar was once considered closely related to the Port Orford cedar and both were placed in the genus Chamaecyparis. In the Jepson Manual of California Plants they were both placed in the cypress genus Cupressus. 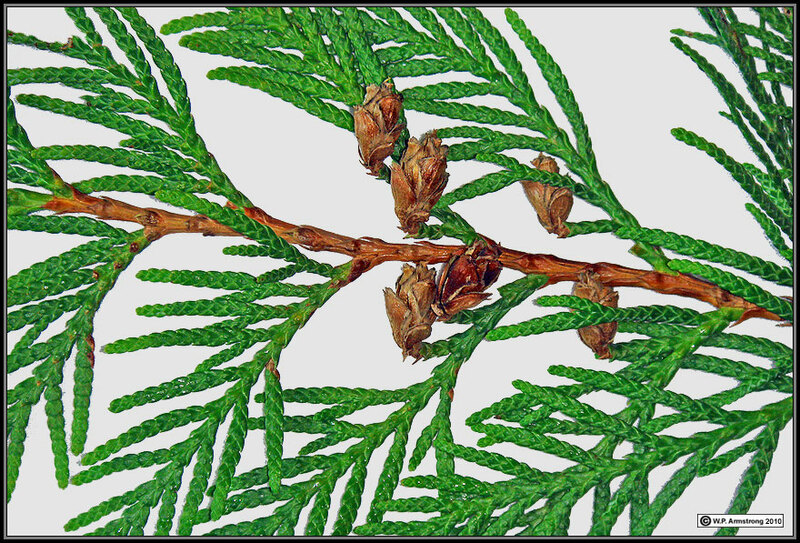 Recent DNA analysis revealed that the Alaska cedar's closest relative is the Vietnamese cypress (Callitropsis vietnamensis). 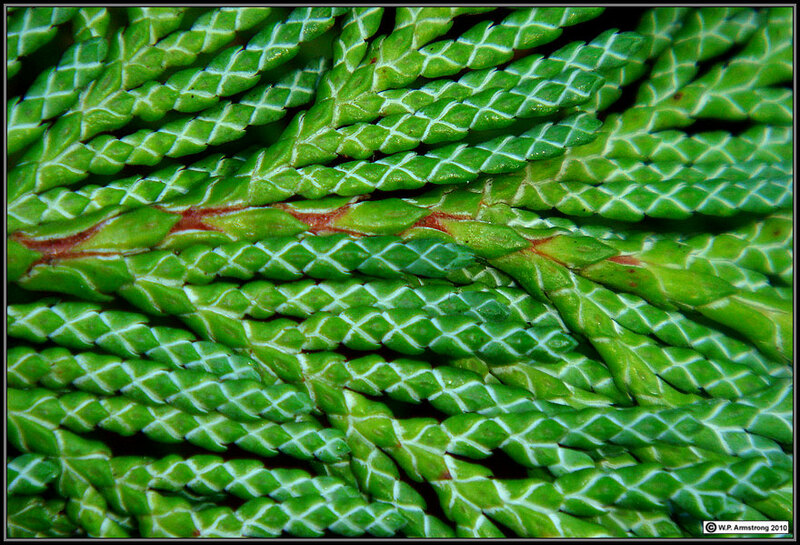 Foliage of Port Orford cedar (Chamaecyparis lawsoniana) showing the stomatal x-pattern on underside of flattened branchlets. Port Orford cedar is native from Coos Bay, Oregon to the mouth of the Klamath River in California, and inland to the Rogue River basin and Mt. Shasta. The wood is highly aromatic and decay resistant. It has been used as a subsitute for Hinoki cypress (C. obtusa) in Japanese temples. Port Orford cedar is threatened in much of its limited natural range by a serious root fungus (Phytophthora lateralis). 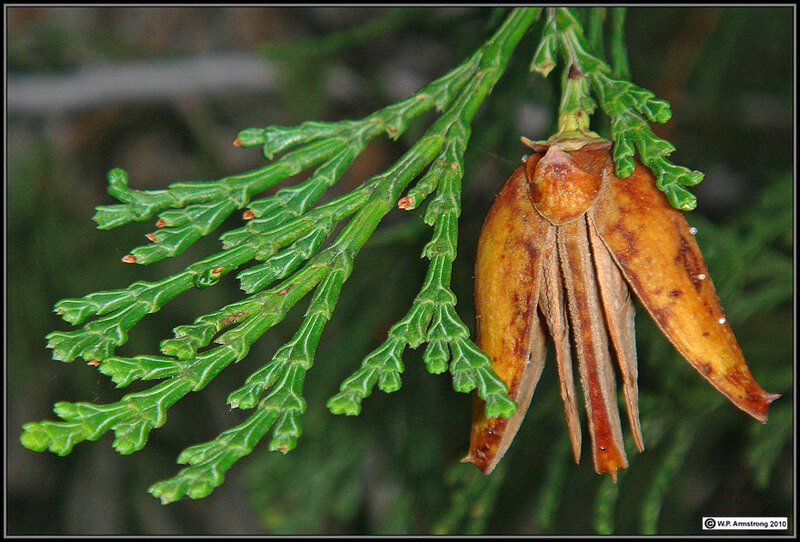 Foliage and seed cones of Port Orford cedar (Chamecyparis lawsoniana). Just when I think I have a handle on the taxonomy of cypresses (Cupressaceae), new research emerges from the amazing field of DNA phylogeny and cladistic analysis. In October 1999, a new cypress species was discovered in northern Vietnam. It was named Xanthocyparis vietamensis. [The name Cupressus vietnamensis also appears in some garden references.] Surprisingly enough, its closest relative was found to be the Alaska cedar (Chamaecyparis nootkatensis syn. Cupressus nootkatensis), separated by thousands of miles and on opposite sides of the Pacific Ocean. The two species were so similar that the authors (Farjon et al 2002), working in Kew, England, combined them generically, and the Alaska cedar became Xanthocyparis nootkatensis. 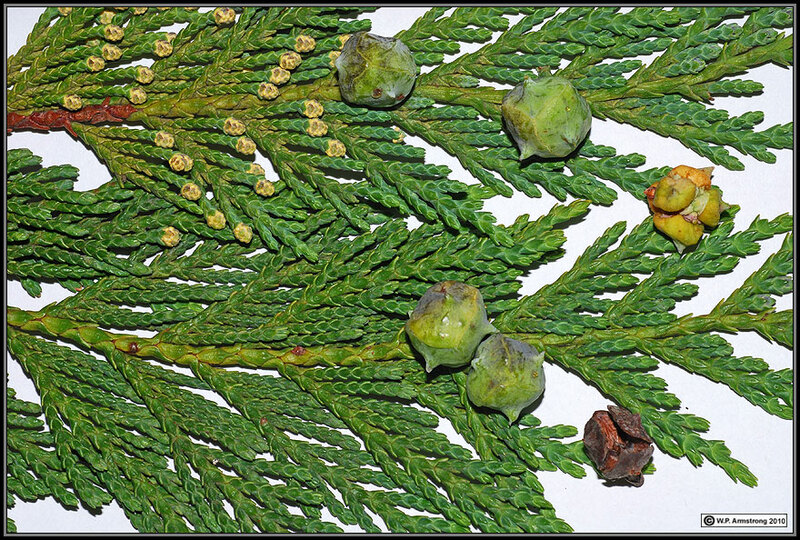 Port Orford cedar (Chamaecyparis lawsoniana) resembles other North American and Asian species of Chamaecyparis in both morphology and DNA, so its scientific name remains unchanged. The Alaska cedar is the only Chamaecyparis species that forms spontaneous, fertile hybrids with Cupressus species when these are grown together in botanical gardens. 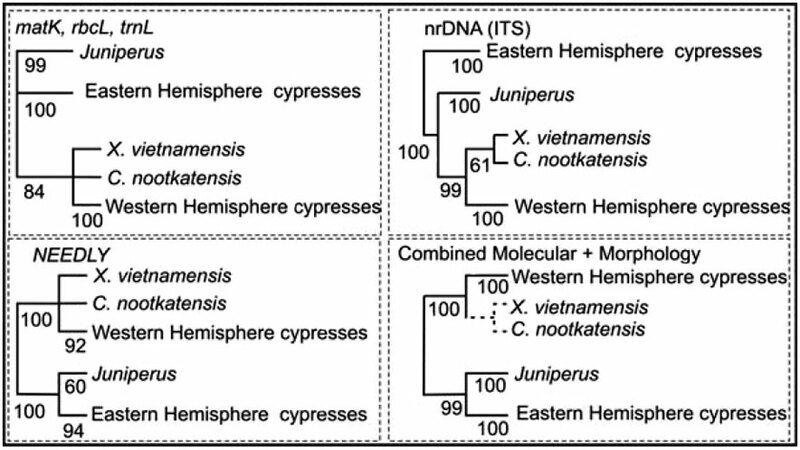 Evidence from DNA and morphology indicates that it and the Vietnam cypress are closely related phylogenetically to the New World species of Cupressus (Little et al, 2004). The Old World species of Cupressus, however, are a separate evolutionay line, as is the large genus Juniperus. True Chamaecyparis species are only distantly related to the cluster genera that includes Old World Cupressus, Juniperus, Xanthocyparis, and New World Cupressus. In a comprehensive study, Little, D.P. (2006) proved that the Alaska Cedar and its Vietnam relative should be placed in the same genus as the New World Cupressus, but that the correct generic name for this group is Callitropsis. His study incorporated 88 morphological and wood-chemistry characteristics in 56 species of Cupressaceae, combined with sequence analysis of three chloroplast genes and two nuclear genes. The name Cupressus technically only applies to the Old World species in this genus. It turns out that Callitropsis nootkatensis was used for the Alaska cedar in 1864, long predating the name Xanthocyparis. In accordance with the Botanical Rule of Priority, the older name must be used. Therefore, Alaska cedar becomes Callitropsis nootkatensis, Vietnam cypress becomes Callitropsis vietnamensis, and the Alaska cedar-Monterey cypress hybrid becomes Callitropsis x leylandii. Damon Little (2006) also proposed that all of the New World Cupressus be placed in the genus Callitropsis. The latter genus superficially resembles the Australian genus Callitris. In the revised Jepson Manual: Vascular Plants of California, Jim Bartel has changed the genus Cupressus to Hesperocyparis (western cypress). Callitropsis may also be moved into Hesperocyparis at the 2012 Botanical Congress in Melbourne. Based on their general morphological appearance, the New World Cupressus (Hesperocyparis) certainly resemble Old World Cupressus species; however, this similarity may be due to parallel evolution (homoplasy) in similar warm, dry climates. Just because these two groups of cypress appear similar doesn't necessarily mean that they are all closely related members of the same genus. DNA comparisons appear to reflect their true genetic affinities and differences. Groupings of species, such as Callitropsis, Chamaecyparis, Juniperus and Old World Cupressus represent separate branches (clades) in computer-generated phylogenetic trees. The Western Hemisphere (Cupressaceae)." Phytologia 91 (1): 160-185.